I'm writing some news directly from the Bologna Children's Book Fair. To this purpose I opened a new section of the blog called "Extra-wire news" to update you in real time with short information I consider of particular interest. I'm starting this session with the presentation of a Picture Book and a tale by Jack London, both by Orecchio Acerbo Publishing House. "Migrando" is the new picture book by Mariana Chiesa Mateos, Orecchio Acerbo Editore, March 2010. It has been officially presented here at the show, this morning, by the author herself and by Christine Weise, President of Amnesty International Italy, who has welcomed and supported the publication of the book with great interest. 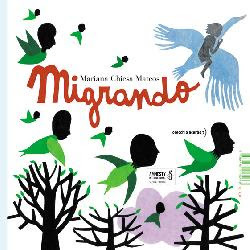 Migrando is a wordless picture book, a wonderful book, that has a double reading because it describes two sorts of migration confronting and meeting: the first is the one we can read in history books, the second much more modern and dramatically close to all of us. The double reading of this book consists as well in the gesture the reader has to do in order to pass from the first to the second part of the book, as he needs to rotate it. As Simone Tonucci, the publisher, was rightly saying during the press conference, the rotation allows the reader to clearly perceive a change in perspective, almost a suggestion to try and switch our point of view finalized to a better comprehension of ideas that might differ from ours. Here a more in-depth analysis, in the section War and Roundabouts. 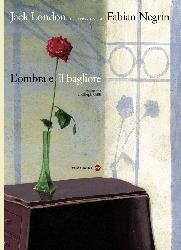 L'Ombra e il Bagliore is a complex tale, a difficult one, written by London in the last part of his writing career - as Goffredo Fofi was rightly saying during the presentation. It's an "obscure" text in the real meaning of this term, as it's entirely hinged upon the ideas of shadow and light: the two leading characters, Paul and Lloyd, live a life of rivalry that will bring to a crescendo of intellectual challenges, up to the final explosion. One of them tries to reproduce absolute black, the other pursues total transparency, both are taking up perfect invisibility in a down to the last blood drop fight. The illustration and graphic behind this book are enormous: there are hollow punches reproducing brush strokes, acetates, tissue-papers, up to original cuts of the pages, always hiding and playing with double. The cover is to be noticed: it reproduces the last image of the book, whose concept is summarized in a perfect synthesis. It is an expensive book, but it's worth every penny. Don't miss it. This is all for the moment, I'll be back soon! Three names and a publisher!